Your case is our priority. You deserve high-quality legal representation. 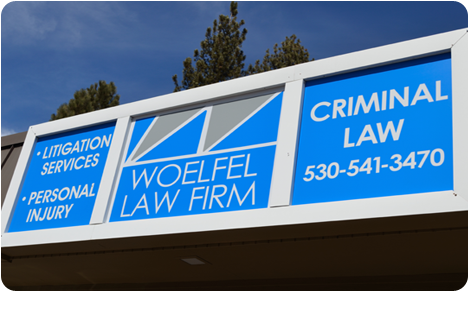 Our lawyers at Woelfel Law Firm in South Lake Tahoe know the judges, prosecutors and court staff along with the local practices and procedures. Your experience with Woelfel Law Firm will be one of thorough representation, compassionate counsel and zealous advocacy. At Woelfel Law Firm we are dedicated to serving our community, and to the protection and preservation of the rights of those facing legal issues in California. Our team is comprised of a highly effective group of attorneys who offer a high level of attention and personal service to each and every client. Our commitment and integrity is matched with investigation and research that provides an outstanding track record of accomplished cases. Our attorneys are known for getting results. We represent clients in El Dorado County, Placer County, Nevada County, Alpine County, Mono County and throughout California in criminal defense cases like DUIs and drug crimes, personal injury cases involving car accidents, abuse and dog bites, and family law cases involving divorce and child custody issues. Get To Know Us. Contact Our Firm. You will work with an attorney who is dedicated to your case from the moment you hire us. We have a reputation for getting results because we are committed to finding the best resolution for you to protect your goals and your future. We provide personalized service and honest advice about your situation. To schedule an initial consultation, call us at 530-541-3470 or send us an email. We look forward to getting to know you and learning more about your legal issue. Attorney Rob Woelfel is a graduate of the University of California at Berkeley and the University of California Hastings College of the Law. Prior to founding the Woelfel Law Firm, Mr. Woelfel was a founding partner in the civil rights litigation firm Loughrey & Woelfel LLP, located in Oakland and Walnut Creek, California. Of counsel Jennifer Peterson graduated from the University of California at Santa Barbara in 1997 with a Bachelor of Arts in Political Science. She went on to earn her Juris Doctor from Golden Gate University School of Law in San Francisco in 2000. At GGU, She also obtained a Business Specialization Certificate with an emphasis in Intellectual Property. She has handled a variety of matters for clients including personal injury, collections, breach of contract, employment law (wrongful termination, age discrimination, sexual harassment), real estate litigation, landlord-tenant and insurance coverage issues. She has also represented a number of small-business owners in various transactional matters including drafting various business and employment contracts, and assisting with entity formation.